In a relentlessly energetic and arresting voice marked by humor and fierce intelligence, Shani Boianjiu creates an unforgettably intense world, capturing that unique time in a young woman's life when a single moment can change everything. Shani Boianjiu was born in Jerusalem in 1987 and grew up in the Galilee. She served in the Israeli Defense Forces for two years. She graduated from Harvard in 2011. Her debut novel has been published or will soon be published in 23 countries. It has been longlisted for the UK’s Women’s Prize for Fiction and selected as one of the ten best fiction titles of 2012 by the Wall Street Journal. She is the youngest recipient ever of the National Book Foundation’s 5 under 35 award. Her writing has appeared in the New York Times, The New Yorker, Zoetrope, Vice, the Wall Street Journal, The Globe and Mail, Dazed and Confused, the Guardian and NPR.Com. She lives in Israel. 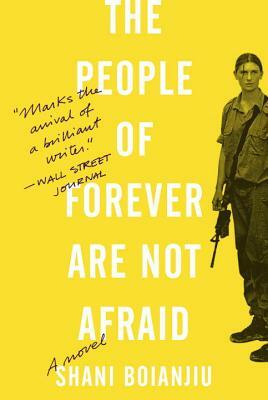 "A dark, riveting window into the mind-state of Israel's younger generation, The People of Forever Are Not Afraid marks the arrival of a brilliant writer." “The much-anticipated debut novel from 25-year-old Shani Boianjiu zigzags between the stories of three high-school friends, Yael, Avishag, and Lea, as they leave their small village on the Lebanese border to take up posts in the Israeli army… glimmers of humor and insight flash brightly in what is a brutally dark novel." "Shani Boianjiu has found a way to expose the effects of war and national doctrine on the lives of young Israelis. So her subject is serious, but lest I make her work sound in any way heavy let me point out how funny she is, how disarming and full of life. Even when she is writing about death, Boianjiu is more full of life than any young writer I've come across in a long time." “If anyone ever tells you the novel is dead, don't say anything, just give them this book. Shani Boianjiu is an enormous new talent. This is one of the boldest debuts I can think of---it reads like it was written in bullets, tear gas, road flares and love. I demand another book from her, immediately."